On Stand A9, Hall 1 at OMC, the Offshore Marine Conference, Ravenna, Italy 29 – 31 March 2017, E2S Warning Signals, the world’s leading independent manufacturer of ATEX and IECEx approved audible and visual warning signals, are presenting the latest developments in their extensive range of explosion proof, hazardous location and intrinsically safe audible and visual warning devices for the onshore and offshore oil and gas industry. 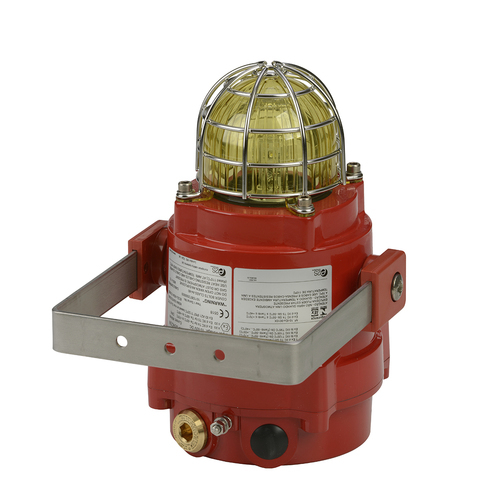 Amongst the new product releases will be the DNV approved and MED compliant signals for fire and general signalling use in marine applications. View the STEx family of warning signals here. E2S, the world’s leading independent manufacturer of visual and audible life-saving signals, has completed a significant development with the introduction of explosion proof beacons featuring field-replaceable color lenses and LED light sources. These latest features, previously introduced with the GRP GNEx and stainless steel STEx families, have now been applied to the popular LM6 alloy enclosure BEx family. The lenses, moulded in UV stable, imact resistant polycarbonate, with integral prismatic structure for enhanced light output, are available in a choice of colors to suit each application. Whether on-site or in stores, being able to replace a lens without special tools is a benefit many will no doubt soon be taking for granted. The LED version beacon has a high output Cree® array, orientated to optimize visibility in any direction. It is user configurable as a steady light for status indicator use, or one of five flashing modes for warning signal duties. DC voltage versions feature three remotely selectable stages enabling multiple warnings to be signaled from one device. While some “in bright daylight” applications will only be satisfied with a Xenon lamp light source, the performance of the E2S high output LED in combination with the new lens provides a practical low power with high output (effective intensity candela) option suitable for many applications. Approved to IECEx and ATEX standards for all Zone 1, 2, 21 & 22 applications with ingress protection ratings of IP66/67. All models have multiple cable entries and large termination areas having both in and out terminals. Stopping plugs for unused M20 entries are included as standard as are a stainless steel lens guard and stainless steel mounting bracket. The BEx family of audible and visual signals are also available as multiple unit assemblies pre-wired with and without junction boxes. View the BExBGL2 prouct details here. On Stand 8230 at ADIPEC, Abu Dhabi, 07 – 10 November 2016, E2S Warning Signals, the world’s leading independent manufacturer, is launching STEx, its latest family of explosion proof audible and visual warning devices. Optimised for use in fire and gas warning systems in offshore and marine safety systems, STEx is manufactured in 316L grade stainless steel to give enhanced corrosion resistance and extended operational life in hostile environments. The latest transducer technology in both the sounders and beacons ensures high sound and light outputs with low current draw, reducing the host system’s power requirements. All STEx products are competitively priced, and the design features large installer-friendly termination areas, reducing on-site time and thereby lowering the total installed cost. 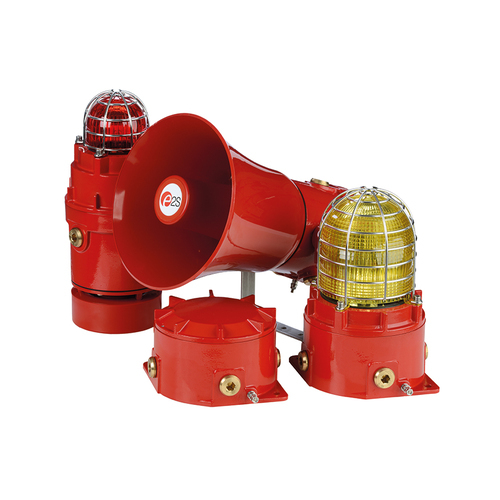 The family includes high output 117 and 123 dB(A) alarm horn sounders with up to 64 tones, including the PFEER standard warning tones, and either flared or omni-directional radial horns, 15 and 25 Watt PA loudspeakers, 21, 15 and 10 Joule Xenon strobe beacons, LED beacons with user-selectable flash patterns, rotating halogen beacons and combined sounder beacon assemblies. The 21 Joule Xenon beacons produce an output in excess of 900 Cd enabling efficient signalling in environments with elevated levels of ambient light. STEx warning devices are sealed to IP66 and are approved to ATEX and IECEx for use in Zone 1, 2, 21 and 22 environments. E2S Warning Signals is showcasing its new STEx premium stainless steel flameproof warning device family for use in aggressive onshore and offshore environments on Stand 5250, Hall 5 at ONS, held from 29 August – 01 September in Stavanger, Norway. E2S, the world’s leading manufacturer of audible and visual warning devices, has developed the STEx family specifically for use in environments where corrosion is a particular issue. The family is launched with ATEX and IEC IECEx approvals; testing to other relevant global standards is currently under way. The STEx family consists of 117 and 123 dB(A) alarm horn sounders with either flared or omni-directional radial horns, 15 and 25 Watt PA loudspeakers, 21, 15 and 10 Joule Xenon strobe beacons, rotating halogen beacons, LED beacons and combined units. Also immediately available are stainless steel junction boxes. All sounder and strobe enclosure bodies are manufactured from 316L stainless steel with ancillary components such as dome guards, mounting brackets and stopping plugs in 316, giving enhanced corrosion resistance over other widely used materials such as 304. Beacons and junction boxes have four M20 entries; sounders and combined units have three M20 entries. ½” and ¾” NPT and M25 adaptors are available. The E2S stand will be manned by personnel from Marin Supply, E2S’s long established Norwegian distribution partner, who will be supported by international sales manager Darren Mann and central Europe sales manager Joachim Ebert from E2S. 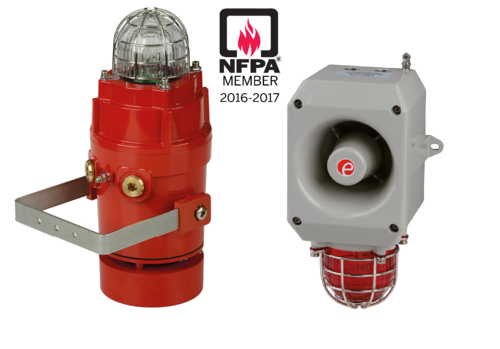 E2S Warning Signals, the world’s leading independent warning signals manufacturer, is now a member of the National Fire Protection Association (NFPA). E2S, which has a dedicated sales support & distribution facility in Houston, TX to serve the North American market, designs and manufactures hi-performance signalling equipment featuring in world class projects. Amongst its extensive globally certified product portfolio, E2S offers UL and cULs approved Haz Loc and industrial audible and visual fire signals suitable for a number of applications. 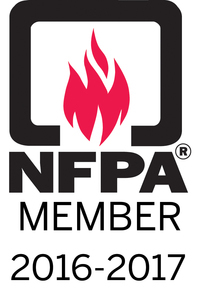 NFPA is a global, non-profit organisation, founded in 1896, devoted to eliminating death, injury, property and economic loss due to fire, electrical and related hazards. The association delivers information and knowledge through more than 300 consensus codes and standards, research, training, education, outreach and advocacy; and by partnering with others who share an interest in furthering the NFPA mission. For the second year running E2S had a booth presence at the NFPA conference and exhibition in Las Vegas from the 13th to the 15th of June 2016. The show provides an excellent networking platform for the US market and E2S has already confirmed its presence at next year show in Boston on the back of a very successful event in Vegas.